I installed this new bike parking in my front yard this afternoon. 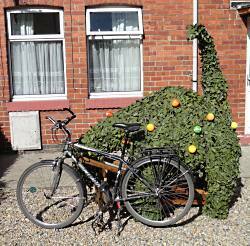 It’s a topiary diplodocus: one of the props from the much-admired York Mystery Plays, which finished last Monday. At the after-show party on Tuesday they auctioned off some of the props, which included a set of topiary animals depicting Creation: elephant, snake, shark, unicorn etc. 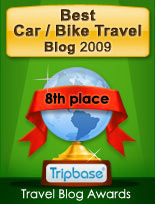 And cycling was a part of Mysteries (just as it was part of the Olympic opening ceremony, with those dove bikes). During the Creation scene, angels on bikes whirled in and out of the hedgy megafauna, harvesting fruit in their baskets. 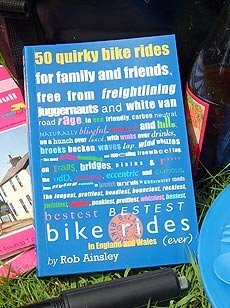 The bikes were auctioned off at the end of the party, too, perhaps offering an alternative to that taxi home for some. So now, when I invite some of my fellow thesps from the show, they’ll have somewhere familiar to put their bikes when they come for dinner. great ides for cycle parking. that is cool ! !